Kanye West and Jay-Z collaboration The Throne’s Watch The Throne. The album notched 12 votes, beating Opeth’s Heritage into second place with 10 votes. 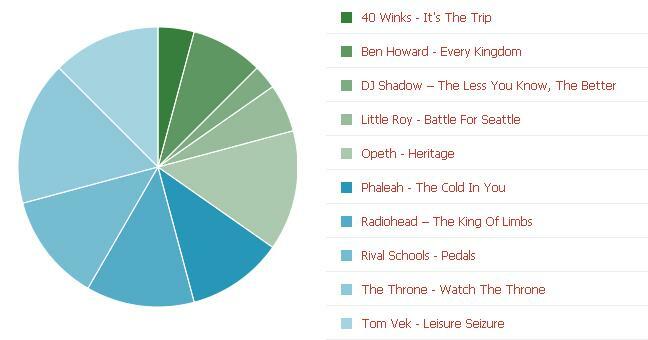 Third was a three-way tie, with Radiohead – The King Of Limbs, Rival Schools – Pedals and Tom Vek – Leisure Seizure all scooping nine votes. Phaleah – The Cold In You got eight, Ben Howard – Every Kingdom six, Little Roy – Battle For Seattle four, 40 Winks – It’s The Trip three and DJ Shadow – The Less You Know, The Better two.